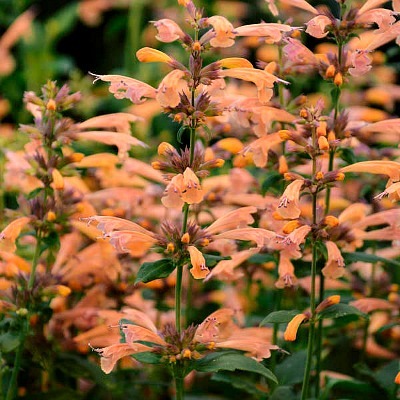 An easy to grow perennial plant, this shorter growing agastache will bring butterflies, hummingbirds and bees to your garden. Be sure to plant extra plants to use as cut flowers indoors. The variations of bloom colors range from soft pink to apricot to peach shades. Matures in the 14 to 16 inch height range. A wonderfully fragrant perennial plant. Plant the Mango Tango Agastache in containers around open sitting areas like patio, decks and gardens. Mango Tango Agastache is grown in 3.5 inch pots. Orders shipping to CA or AZ may be bare rooted and root washed before being prepped for shipping.